An attempt to re-create pottery of the Vatin culture has been made within the CRAFTER project (Crafting Europe in the Bronze Age and Today), whose aim is to help revive modern-day artisanship by drawing inspiration from Bronze Age pottery of four European Bronze Age societies: El Argar (Spain), Únětice (Central Europe), Füzesabony (eastern Hungary) and Vatin (Serbia). This report presents series of experimental tests conducted by a team from the Regional museum at Paraćin, Serbia, one of members of the CRAFTER project. This research focused on the behavior of various mixtures of clays, using different modelling and firing techniques. The objective was to discover the most suitable blend, which will provide the best results in recovering technology of Vatin pottery production. The selection of clay and temper determines plasticity and porosity. It also affects the drying of a vessel and its resistance to thermo-shock and firing. The Bronze Age Vatin culture has been known in archaeology as a cultural phenomenon distinguished by a specific material culture which existed between c. 2200 to 1600 B.C. in the region of the southern part of the Pannonian Plain, and the area along the lower Sava river and south of the Danube river. The Vatin culture followed on from the Early Bronze Age cultures in the region, indicating stabilization in this area after the disintegration of the Aeneolithic Vučedol culture by tribes from the Russian steppe (Garašanin 1979, p. 504; cf. Ljuština 2012, pp.148 – 157; Gogâltan 2017, p.32, Fig. 3). The selection of clay and temper determines plasticity and porosity. It also affects the drying of a vessel and its resistance to thermo-shock and firing. Therefore, the technology of pottery production includes a mixture of different clays (cf. Djordjević, 2016). Thus, we decided to manufacture vessels made of a mixture of different clays, from numerous local sources that would be fired in open air (See Figures 1,2 and 3)1 . Quartz sand and chamotte were used as temper (See Figure 4). The results of the experimental tests are described in the following paragraphs. Blend 1 consisted of three components. The first element represents fine, oily, blue clay (See Figure 6), from the village of Madjare, near Ražanj (See Figure 5/2). This area was known for the exploitation of clay for bricks and the production of crepulja - a shallow clay container, which was used for baking bread. This type of dish was utilized from the Middle Ages to the half of 20th century. Clay from this source is very clean with very little applicability, functional materials (such as sand) and organic impurities. It was mixed with c. 30% of industrial clay, which contained quartz sand in the ratio 50:50. Industrial clay with quartz is suitable for making large vessels, the roughness allows for the manufacturing of a thicker wall (1cm) on the recipient. Fine clay can be used only for making small vessels, with volume of c.2 dcl. These vessels were dried quickly, and firing was easily controllable (See Figure 8/1). The third component is very fine, dark red clay See Figure 7) from the second source detected in the village of Lešje, in a vicinity of the town of Paraćin (See Figure 5/2). This clay was suitable for modelling and burnishing of the pottery. The final experiment suggests that blend 1 is of low resistance to thermo-shock during firing because of its greasy properties. This feature required a long drying process, controlled firing and a low rise in temperature, in order to avoid cracking. 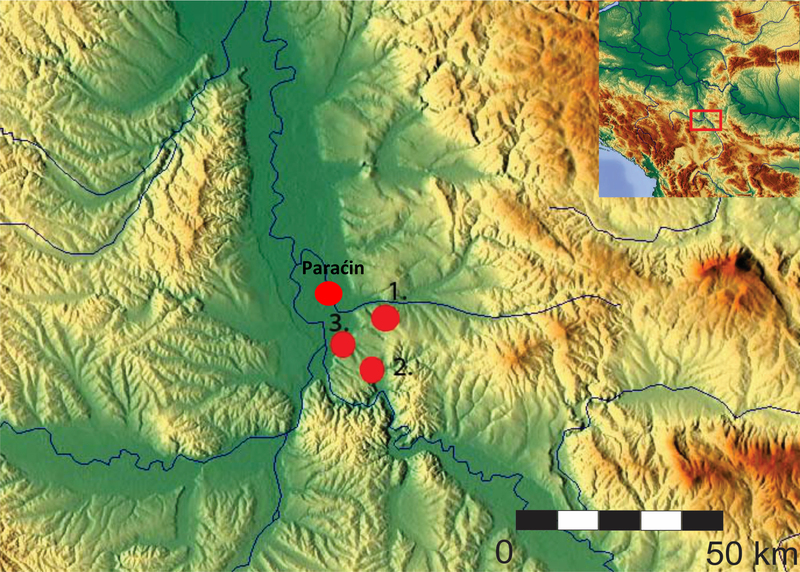 Blend 2 included dark red and grey clay which was detected in a pedological profile of the second source, which has been detected in a vicinity of the village of Lešje near Paraćin (See Figure 5/1). This mixture contained equal levels of lean and grease, which was reflected in exceptional modelling, easy polishing, and the production of good quality ceramics (See Figure 8/2). Blend 3 represented clay from the third source, detected in a vicinity of the Neolithic site of Turska česma, Slatina (See Figure 5/3), which also contained equal levels of lean and grease. This was mixed with chamotte, resulting in a mixture which behaved exceptionally in modelling and polishing. Blend 4 consisted of all clays listed above, which were associated with 20% of chamotte and 10% of quartz sand. This mixture showed the best results in modelling and firing. This report presents an experimental examination of four mixtures of various clays and tempers from different sources. The objective was to discover of the most suitable blend, which will provide the best results in recovering technology of Vatin pottery production. Observations showed that lean and grease impacted on the behaviour of clay during modelling and firing of vessels. Their negative impact was noticed in the case of blend 1. The results indicated the necessity of a uniform mixture, which was reached in the cases of blend 2 and blend 3. Blend 4, which included all examined clays associated with 20% of chamotte and 10% of quartz sand, provided the best result. These experimental tests provided positive results and present one step forward in discovering technology of prehistoric pottery production. 1. These experimental tests were filmed during December 2018. It was included in a film by the Serbian team, as part of the CRAFTER project. The film production is underway, with a working title “A secret of a potteryman“. Members of Documentary Talent box crew are: Vladan Caričić-Tzar, director& producer; Vesna Vuckovic and Vladan Caričić –Tzar, scenario; Bojan Rakić, cinematographer; Dejan Jovanović and Vladan Caričić Tzar, production designer; Branislav Godić, editor; Vladimir Milačić, sound designer. Djordjević, B. 2016. 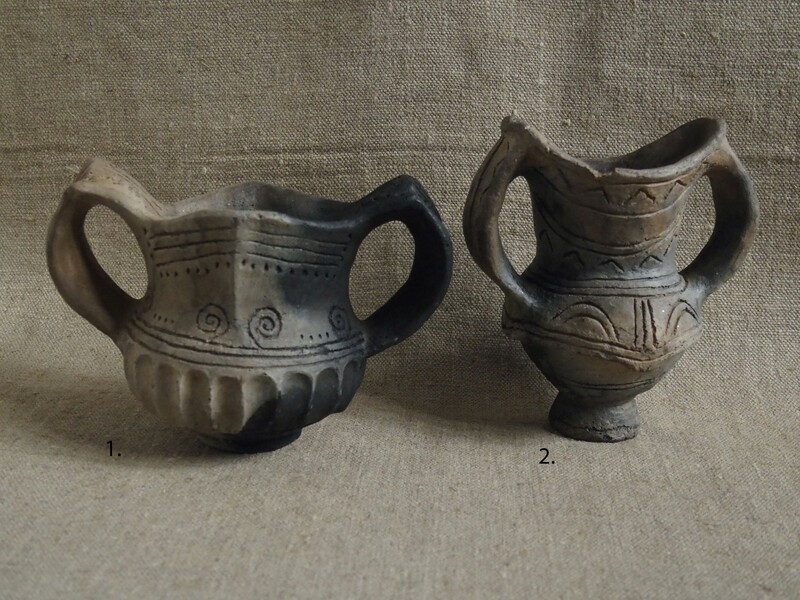 Etnoarchaeological research in ceramic technology, the Zlakusa case study. [Unpublished PhD thesis] University of Belgrade, Faculty of Philosophy. Garašanin, G. 1979. Vatinska grupa. PJZ IV, pp.504 - 519. Gogâltan, F. 2017. The Bronze age multilayered settlements in the Carpathian Basin (CCA. 2500 – 1600/1500 BC). An old catalogue and some chronological problems. Journal of Ancient History and Archaeology 4.3. pp, 28 – 62.